Twig is a full service vegetation management company. 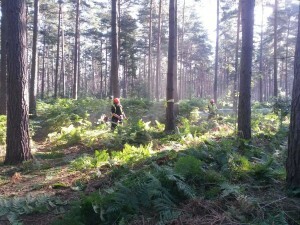 Twig uses innovative vegetation clearance techniques to rapidly clear sites for development, which is possible as a result of our many years of experience working in sensitive habitats and with protected species. Our ecologically focused Project Managers are committed to remaining one step ahead of your development programme. Vegetation clearance should be undertaken with care from March, to September to avoid disturbance to nesting birds and other wildlife. If works are necessary outside of the optimal periods, pre commencement checks are undertaken and results recorded to ensure that all tasks fall within best practice guidelines and within the Wildlife and Countryside Act. We can remove waste material and dispose off site, recycling materials where possible (i.e. chipping and composting) to avoid the impact of landfill. Where possible vegetation can be kept onsite to enhance habitat for target species whilst reducing costs. Twig offers Habitat Creation for species such as reptiles, amphibians and invertebrates. The hibernacula are constructed from a variety of materials; logs stone and turf, topped with soil then seeded or finished with turf, making the optimum hibernacula for reptiles and amphibians. Natural England is a non-departmental public body of the UK government responsible for ensuring that England’s natural environment, including its land, flora and fauna, freshwater and marine environments, geology and soils, are protected and improved. Visit Natural England best practices and guidelines for access and rights of way, land management, landscape, parks, trails and nature reserves, protected sites and species, wildlife and habitat conservation. For more information on our Vegetation Management & Clearance services and for a conversation about how we can look after you, please call 01892 722948 or 01892 723226.